Gum disease is an extremely common oral health condition: most adults experience preliminary symptoms of this disease at one point in time, although good oral hygiene habits will keep the worst of the effects at bay. The origin of gum disease is plaque, the sticky substance deposited on teeth and gums as a result of bacterial activity. Daily brushing and flossing removes plaque, but if it’s not removed, it quickly hardens into tartar, which is very difficult to get rid of with a toothbrush. 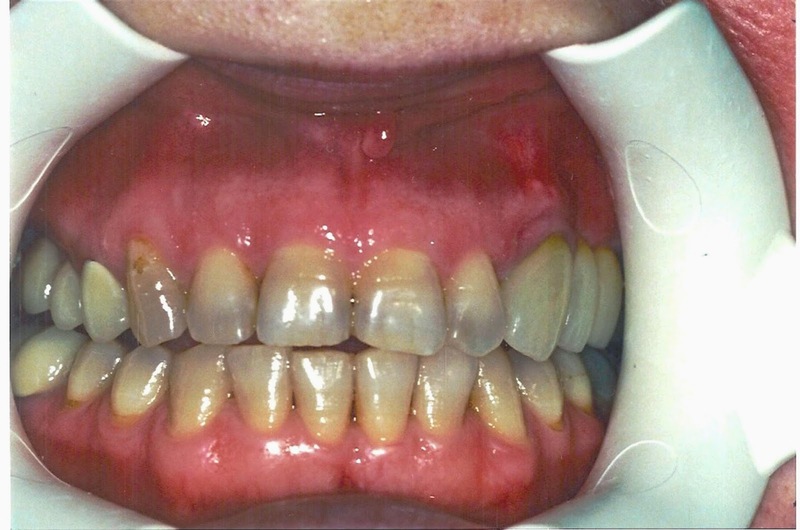 The initial stage of gum disease is called gingivitis. At this stage, your gums may bleed a little when you brush your teeth, and might appear swollen; for some people, however, there might not be any apparent symptoms. As the gingivitis stage progresses small pockets of infection develop at the gum line, causing the gums to become inflamed and discolored. Other symptoms may include a metallic taste in the mouth, bad breath, sensitive teeth, and painful gums. Eventually, the inflammation causes damage that leads to periodontal disease, in which the gums recede and become progressively more infected. This causes the teeth to loosen and they may fall out or need to be removed. The bacteria that form plaque feed on starch and sugar deposits on the teeth, which is why regular brushing and flossing is your first and best line of defense against gum disease. Twice-daily brushing with fluoride toothpaste, along with daily flossing, is the best strategy to remove plaque deposits before they are able to harden into tartar. Sometimes, even despite your best efforts, tartar can still develop on your teeth. Because tiny deposits of food become stuck in pockets between teeth or beneath the gum line, they are difficult to detect and remove. Once tartar is present on your teeth the safest and most effective way of removing it is with a professional dental cleaning, so you can consider your dentist your second line of defense against gum disease. Even if your gums are in the early stage of disease, professional cleaning and tartar removal will reduce inflammation and help your gums and teeth to recover. Aside from oral hygiene, there are several risk factors to gum health. Smoking and diabetes, for example, have a negative effect on gum health because they contribute to poor circulation and increase infection risk. Another risk factor is low saliva levels, which can be caused by certain medications; chewing gum after meals can help stimulate saliva flow. Green Bay Dentistry & Orthodontics works to educate patients on oral health prevention. Call the office to schedule an appointment and keep routine cleanings an important part of gum disease prevention. Oral and maxillofacial surgery is a surgery to treat many diseases, injuries and defects in the head, neck, face, jaws and the hard and soft tissues of the oral. After reading out this content I can say that there is a lot of info of preparing for Oral surgery. Thanks for this info. I recognize the means you are running this blog site requires a great deal of work. No doubt that you have covered the subject how to stop receding gums is exceptional. Exceptionally helpful details specifically the component where you have actually discussed the causes of receding gums and remedies. Thanks for sharing this important information. I really like this post. While visiting our dentists, we often become tensed due to fear of facing any pain while doing dental procedure. But dental sedation can reduce the pain and make any procedure more comfortable. Try stand alone dental discount plans in NY to get discount offer while visiting your dentists. Thank you for the article. Dental care treatment is expensive and it is almost impossible to afford all the cost if you belong to a middle-class family. So you can choose among dental discount plans Ohio to save your money in dental cost.